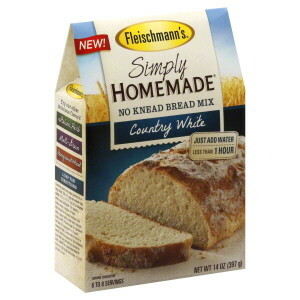 I got a breadmaker for Christmas, and Mike picked up one of Fleischmann’s Simply Homemade bread mixes at the store. I thought it was sort of silly, isn’t the whole point of having a bread maker to be able to throw some ingredients together and get great bread?, but after a couple of failures doing exactly that, I decided to try it. It was delicious! Seriously, soooo good. I think I got the Country White, though I threw away the box and the bread was actually sort of brown. I also cooked it for 3 hours, rather than on a rapid cycle. You don’t get a particularly large loaf – but if what you want is flavor, this has it. I think next time I’d select light crust rather than medium, however. I don’t know how much the package was, my bet is that it’s not cost effective, but if I found them on sale I might buy a couple to keep to make some quick bread without having to put much thought into it.